This attraction utilizes a vacant area within the Taipei Zoo's property to provide a scenic complement to the Maokong Gondola Taipei Zoo Station with regular dancing fountain performances. 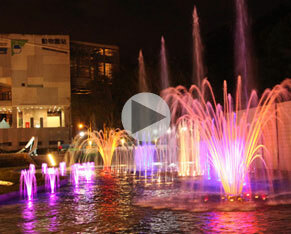 Dancing Waters combines the grace of flowing water with the dazzle of color. This dance begins every half hour, offering a soothing place for visitors to relax and enjoy the show. 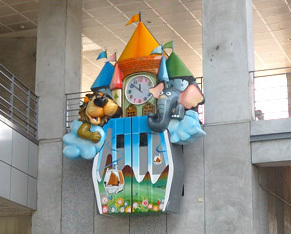 Located in the Waiting Area on the ground floor of Maokong Gondola Taipei Zoo Station, the animals on the clock spring into action on the hour, moving with the music to brighten the day of people waiting for the gondola. 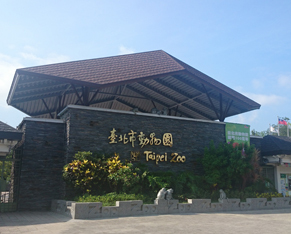 A favorite of all generations, the Taipei Zoo is the perfect destination for families and couples. The zoo features Formosan Animal Area, Children's Zoo, Asian Tropical Rainforests Area, Desert Animals Area, Australian Animal Area, African Animal Area, Temperate Zone Animal Area and Birds World. The ever-alluring panda duo Tuantuan and Yuanyuan, the adorable koalas and the constantly active penguins are the stars of the zoo. If you haven't seen them, then you haven't visited Taipei Zoo!